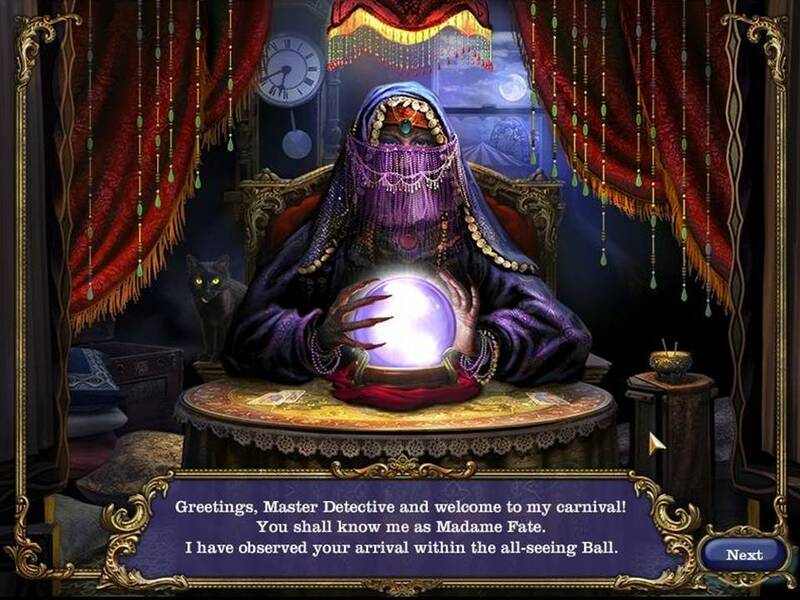 In Mystery Case Files Madame Fate, peer into Madame Fate's crystal ball and save the mysterious fortune teller. The good Madame has foreseen her death at midnight. Can you assist her by investigating her fellow carnival workers to determine their whereabouts at midnight? For any crime you must have both motive and opportunity. All have motive, but who had the opportunity? Is there anything creepier than a carnival? Especially at night, a carnival looks like some psychopath’s subconscious. The looming shadows interspersed with garish colors and flashing lights, the tinny calliope punctuated with maniacal laughter, the deep fried oil smell of corn dogs overlaid with the burnt sugar scent of cotton candy — it’s an assault on the senses. Carnivals, fairs and the like have been the subjects of innocent and not-so-innocent movies and television programs. Who could forget Pennywise the evil clown from Stephen King’s It? Personally, my tastes run to the more subtle when it comes to the nastier side of carnivals. One of my favorites is the film adaptation of Ray Bradbury’s amazingly eerie Something Wicked this Way Comes. Jonathan Pryce, as the malevolent Mr. Dark, confirmed my deepest fears about what goes on at a carnival after the last patron leaves. While not overtly frightening, Something Wicked masterfully keeps the hairs on the back of your neck bristling with its murky moodiness. 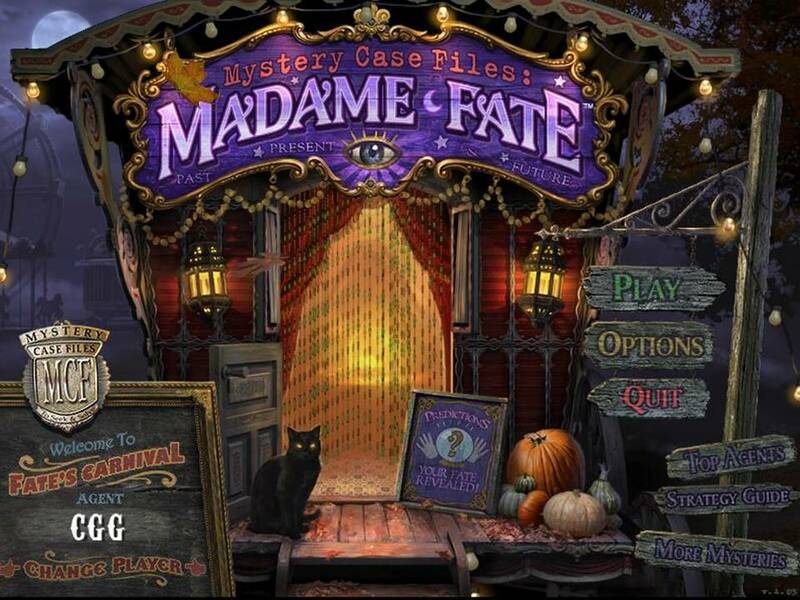 Mystery Case Files: Madame Fate reminds me a lot of that favorite movie and, as such, I’ll tell you right now, I’m a fan of this game. 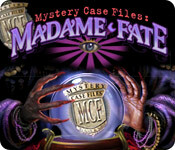 Mystery Case Files: Madame Fate does an exceptional job of setting mood. The plot involves that aforementioned creepy carnival and its resident fortune teller, Madame Fate. Madame Fate’s crystal ball has turned the tables on her, predicting her own demise at the stroke of midnight. 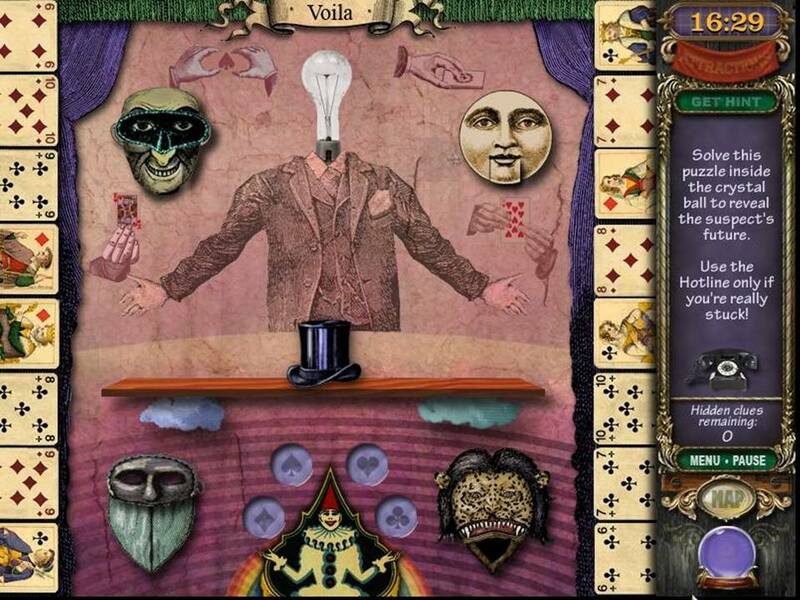 Conveniently, the crystal ball shares neither the means nor the murderer, so it’s up to you to thwart the crime and unmask the criminal by using the crystal ball to examine the whereabouts of various suspects at 12 a.m.
Like many of the other Mystery Case Files games of this vintage, you’ll accomplish your task by gathering clues from several hidden object area locations and then face a final mini-game challenge at the end of each round. The suspects and locations are wonderfully campy and theme-specific, the bearded lady and Larry the mediocre magician being just two of the comical characters you’ll encounter in spots like the entrance to the "insane-rator" thrill ride, the individual performers’ tents and the jaunty food carts. 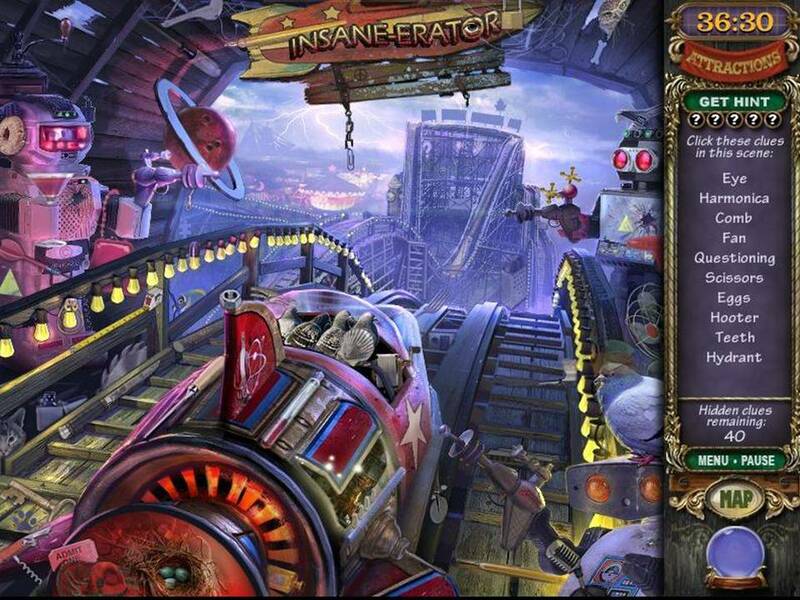 The hidden object areas in Mystery Case Files: Madame Fate have a fun little twist in that some offer mysterious "shape shifting" objects that provide access to additional locations. A hidden object area inside a hidden object area you might say. The visuals seem slightly crisper than MCF’s earlier efforts, although the "find 11 of something" scenes were clearly created by a sadist. Eleven butterflies, some the size of pinheads and cloaked in the background of patterned wallpaper, could use up all five of my precious hints in one fell swoop. Obviously, there’s more room for improvement on that front. The audio adds to the mood and Madame Fate’s creaky gypsy-accented voice breaks in from time to time to encourage you in your endeavors. 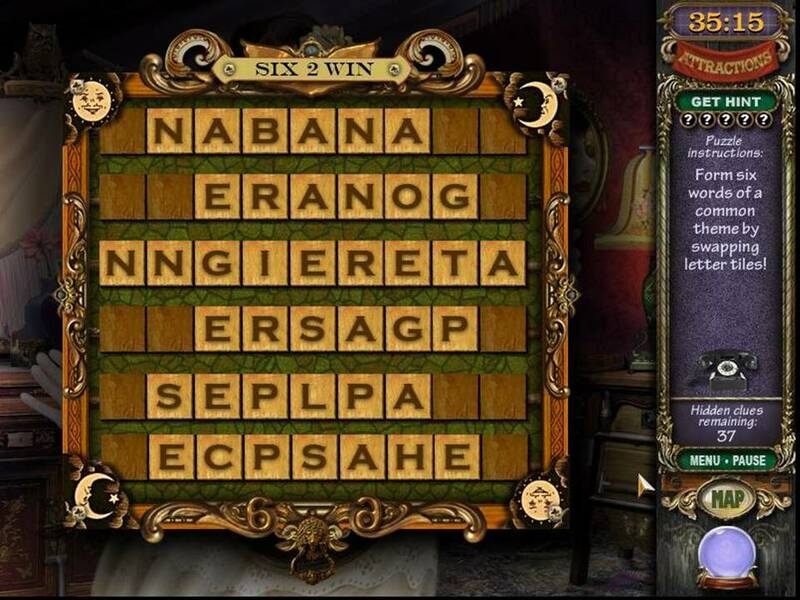 As mentioned above, the Mystery Case Files folks are still as parsimonious as ever when it comes to hints, and I really feel like they are missing the mark by providing little to no text instructions for the mini games. For example, I enjoyed the straightforward word-focused games. One required you to unscramble a set of related words and the other to make 10 four-letter words from seven letters provided. However, the one where you made an old fashioned film reel had me mystified. To the right of this game is a graphic of an old rotary phone with a note suggesting you use the hotline if you are "really" stuck. Finally in exasperation, I clicked on the graphic only to be given the option to "skip" the game. So my only choices are figure it out on my own or give up? Nothing in between? These minor criticisms notwithstanding, I thoroughly enjoyed this game. The Big Fish website notes this was the number one hidden object game of 2007, and I’m not surprised. 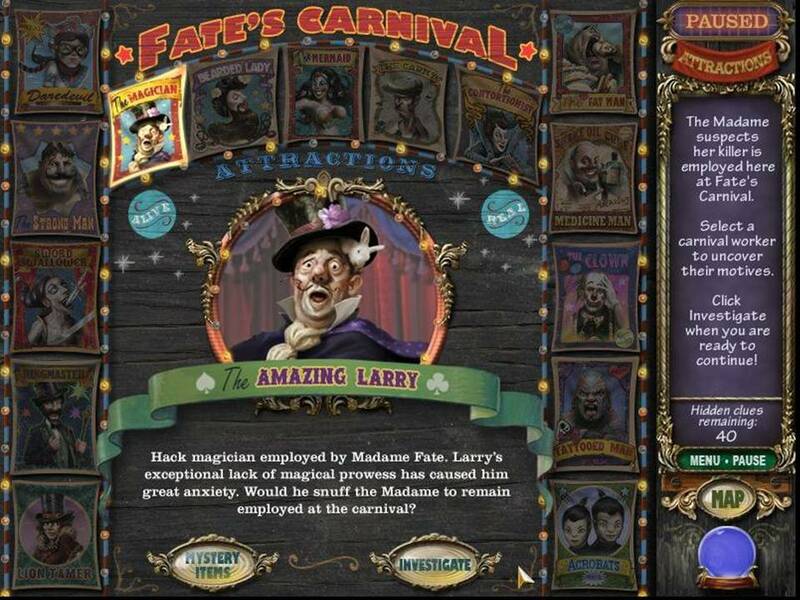 I recommend Mystery Case Files: Madame Fate for the fabulously freaky graphics by themselves, let alone the inventively themed gameplay.